As I mentioned in my last post, my husband Mike and I did an overnight stay at Waverly Hills Sanatorium, which, according to the Ghost Hunters TAPS group, is believed to be one of the most haunted places in the world. More than 63,000 people died there. 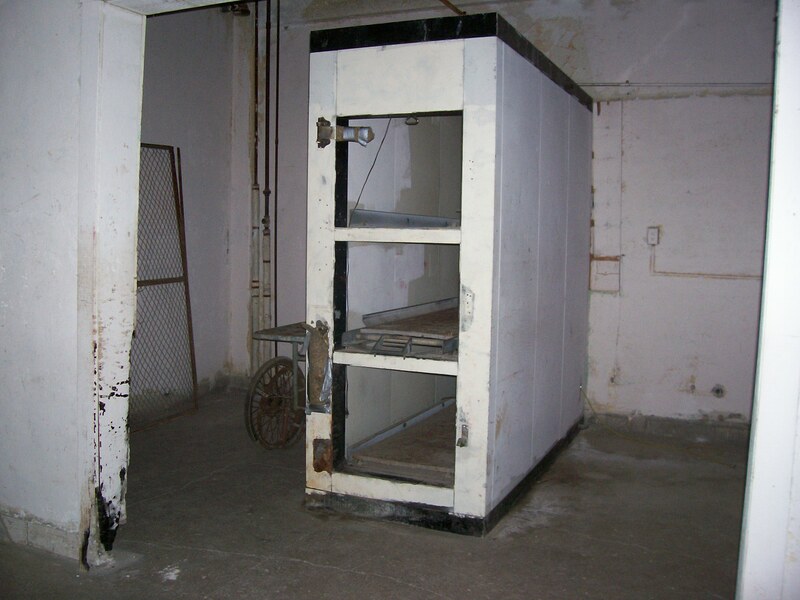 So many, in fact, that they built a death chute to transport the bodies down to hearses so that patients wouldn’t constantly see bodies being taken away. The death chute was one of the areas we got to explore. But first, we were taken on a brief tour of the 5-story building and roof so that we’d learn our way around, and know the hot spots for paranormal activity. Most of us had brought cameras. A few people had more advanced equipment. We had a digital recorder that we were hoping was good enough to record EVPs. Our tour guide lead us through the building, telling stories about ghost sightings in the morgue, the nurses’ station on the 5th floor, the hallway near an old elevator shaft, and the electroshock therapy room. Mike and I listened eagerly and started scoping out where we wanted to go first. There were a lot of people on our tour and we wanted to break away so that we could do voice recordings without having a lot of human interference. Mike wanted to start in the morgue. The guide finished his spiel and told people to keep their flashlights off; our eyes would grow accustomed to the dark, but we’d never see anything if we kept shining flashlights all night. And he told us not to jump out at people or pretend this was a haunted house. We’d come to go ghost-hunting, not act like children. He finished talking and my husband and I raced down the stairs back to the morgue. It was immediately creepy walking around that old, dark abandoned building on our own. I wondered what we were thinking? Did we really want to see ghosts?? Then he began screaming. And screaming. And running down the hallway. If you listen closely to the recording, you can hear my footsteps running behind him as he screams. Some joker had decided to scare his friend by laying inside the morgue table with his boots sticking out – which is exactly what we’d been told not to do. But Mike and I got there first. Scared the crap out of us, though it’s fun now to listen to the tape. But in the moment, we were pretty freaked, and only 30 minutes into a long night of wandering in the dark looking for more things to scare us. Thankfully, nothing scared us as much as that — until we were in the car driving to our hotel at 4:00am and listening to our recorder to hear whether we’d captured any EVPs. You can listen to both audio clips in the attached file. First you’ll hear Mike screaming as he spotted the feet in the morgue. Then, you can listen to the other recording and pretend you’re the TAPS unit, too. Can you make out the words? It’s a little muffled, but we hear a voice saying, “Get out.” We hadn’t heard it when we were inside. If we had, we would have certainly heeded the advice. LOL. I’m sure it crosses many people’s minds, but it was really creepy down there, and this picture is enhanced so you can see it. It was very dark. Sounds like a creepy place to visit…perfect for me. I love dark, creepy places. Did you ever feel a heavy presence from all the deaths that occurred there? There was one hallway that I could not bring myself to go down. All the hallways were pitch black, but this one in particular seemed ominously black. It was a heavy-presence feeling. I felt no need to be uncomfortable and continue forward. I turned around and went to the rooftop for fresh air instead. WHS seems like it is just so eerie. How was the “death chute”? Ok..it’s halloween night, I think I might wait to hear the creepy voice. The story of hubby running screaming is just way too funny ! I’m amazed that they let you loose to wander the building on your own. I’d be too scared to do that. More power to you! Oh my gosh! I can’t listen to your recording. I would love to hear Mike scream ;-), but I’m such a scaredy cat and don’t want to hear anything else. Great story! Sometime when you want a good laugh, listen to him scream. Oh my gosh, so spooky! It’s a little muffled, so you may have to take my word for it regardless of whether you listen. It’s just not as clear when I downloaded it to the computer. That was too funny 😆 I agree that it was brave of the two of you to go wandering off on your own like that! The link doesn’t seem to work, or is it just me? You guys are just too funny; I just love your adventures and knew your Halloween post wouldn’t disappoint! 🙂 It was definitely an adventure that night. I hope you’re recovering from Hurricane Sandy and weren’t affected by the new storms, letizia. I’m happy to report that we got power/heating 2 days ago (although my parents are still without so they are staying with us until they do). So we were able to watch the beautiful snowfall of the latest storm from a warm, lit home rather than from a cold, dark house!